› Problems › Outlook Only Starts in Safe Mode? This is caused by installing KB3114409 - it causes Outlook to run in Safe mode, which uses the default settings. Your customizations aren't lost, they just aren't being used when Outlook is in Safe mode. Microsoft released this update to fix the problem: December 16, 2015, update for Outlook 2010 (KB3114560). It is highly recommended that you install this update instead of uninstalling KB3114409. Microsoft removed the update, so users who haven't installed the December updates yet won't be affected. Users who are affected should install the hotfix December 16, 2015, update for Outlook 2010 (KB3114560). A second option is to set a registry key to disable Safe mode. If you are in a hurry, this is obviously the faster fix but you won't be able to use Safe mode in the future (for troubleshooting) until you remove the key. If any key in the path is missing, you'll need to create it. Right click on the last key, choose New, then Key and type the key name. Begin typing Installed Updates in the Search Control Panel field at the top right. The original reason this article was written in 2011 was caused by an issue with the search service. Outlook 2003 and 2007 are affected by this problem. Solution: Repair your Office installation and run scanpst on the data file. The problem is caused, in part, by the 'Windows Search' service. This service provides Outlook's Instant Search and Window's file search features. For a quick fix, you can stop or disable the Windows Search service. To do this, open the Administration Tools folder in the Control panel and double click on Services. Look for Windows Search in the list. Double click it, then click Stop and Apply. You can also right-click on Windows Search and choose Stop. The next time you use Instant Search or Windows Search, the service will restart. To disable the service for a longer period, select Disable in the dropdown and click the Stop button, then Apply. Please note: when you disable the search service, Windows File Search and Outlook's Instant Search won't work. Stop the Search service only so you can use Outlook in "normal" mode until you have time to repair it. 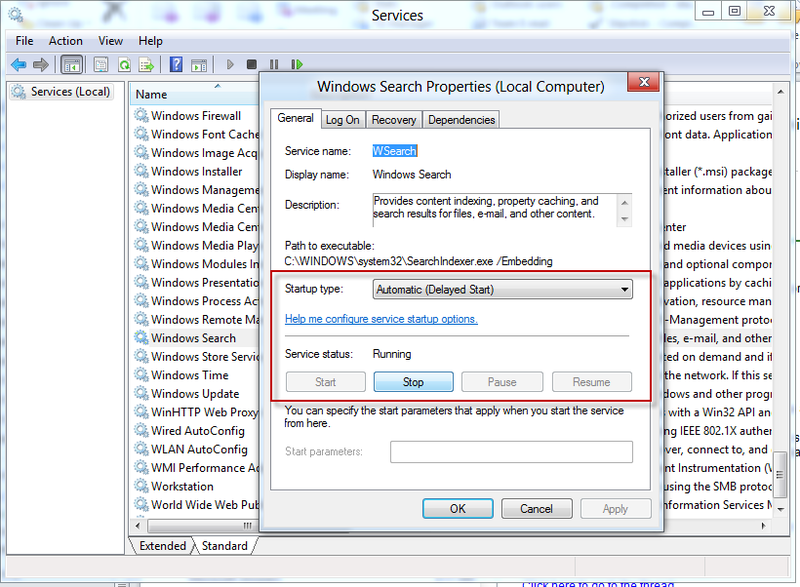 In Windows 7, you can type Services in the Start menu's search command or in all versions, type Services.msc in the Run command. I have tried to install the hotfix, and have also tried to uninstall the KB3114560 update. Each time, my computer gives me the message "An unknown error occurred. The update was not uninstalled". Has anyone run into that problem? I haven't been able to find a solution anywhere. Thank you, the KB3114560 update worked like a charm. Thank you very much for the info. I removed the update and Outlook in no longer in safe mode. Much appreciated. It is sad that Microsoft does not have a fix for this yet? They released a hotfix in December and https://support.microsoft.com/en-us/kb/3114570 this week. Diane, this registry fix worked for me. Thanks very much for your help in getting rid of this pesky little problem. This worked perfect for me--THANKS! The Registry key has been fixing this issue for my staff members. We did not publish the KB that has been causing it either. Thank you for this article! Installing this update KB3114560 fixed my problem.